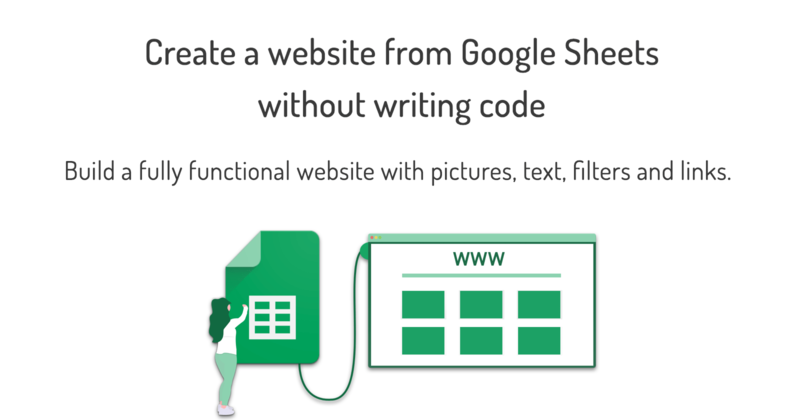 Sheet2Site is a tool that will help you create a beautiful website from Google Sheets with pictures, text, filters and links, without writing code. Founded by Ukrainian developer Andrey Azimov when I he was working on my previous project he needed to manage a lot of content like titles, links, image etc. Using SQL database was too complicated so he decided to connect this speadsheet to my website and it worked like a charm. Later he thought it might be great to create a tool that would help people generate beautiful websites, just in a few clicks, from Google Sheet, without code. In March 2018, he launched Sheet2Site and since then, thousands of people made their own webistes. You can read the full story here. © 2019 Sheet2Site. All rights reserved.